In a mixing bowl, cream butter with vanilla. Add dark cocoa, powdered sugar, and milk. Mix well. Add flour and salt. Mix just until combined. With hands, form dough into a disk. On a floured or sugared surface, roll dough to ¼ inch thickness. Using a biscuit cutter, cut shortbread disks and place on parchment lined baking sheets. Bake at 350 degrees for 10 minutes. Remove parchment sheets from pan and allow shortbreads to cool completely. Beat cream cheese until smooth. Add powdered sugar and mix well. Melt dark chocolate in the microwave. Beat into cream cheese mixture. Add cold espresso and mix well. Place truffle into a piping bag and pipe perimeter of shortbreads, leaving a well for caramel. 1 jar caramel ice cream topping poured into a Ziploc bag. Snip the end, and squeeze approximately 1 tsp into truffle well. Reserve remaining caramel for final drizzle. Beat cream cheese until smooth. Add powdered sugar and mix well. Melt milk chocolate in the microwave. Beat into cream cheese mixture. Fold in Cool Whip. Spoon milk chocolate cream into a piping bag and pipe over dark chocolate and caramel layer. In a cold mixing bowl, beat heavy cream, vanilla, and powdered sugar until stiff. Spoon whipped cream into a piping bag and pipe a rosette to cover milk chocolate cream. Use remaining caramel ice cream sauce to drizzle over whipping cream. 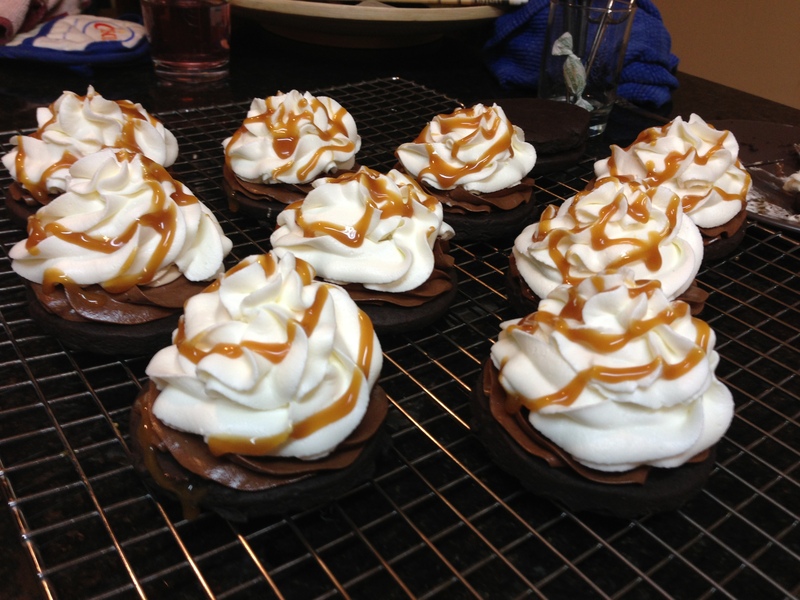 Refrigerate mini pies for 15-30 minutes before serving. In my first trip to World Food Championships in 2013, I really had no idea what I was getting myself in to. Luckily, my Signature dish was one that I was completely comfortable making. In that first year, I didn’t realize that I could have a “team” in my kitchen, so I had my entire first two desserts timed, and I knew that I could make them by myself. Well, even though I thought I didn’t belong in the Kennmore Kitchen Arena, I guess I did something right, because these little tarts got me to the Top 10 and my first trip to finals, which, in turn, got me my second trip to WFC. These little tarts are still some of my most requested and favorite to make.